Phakic intraocular lenses (pIOLs) have now been used for many years to correct myopic, hyperopic, and astigmatic refractive errors. Currently, anterior chamber pIOLs, angle-supported or iris-fixated models, and posterior chamber pIOLs, sulcus-fixated or free-floating models, are in use. Artificial lens implantation is so far the only refractive treatment for high refractive errors. The first pIOLs were placed in the anterior chamber angle as early as 1953 by Dr. Strampelli. These lenses were plagued with endothelial decompensation, angle fibrosis which led to subsequent glaucoma, and pupil distortion. Due to the significant complications experienced with these lenses nearly 30 years transpired before new lens designs began to emerge. Posterior chamber pIOLs came into existence in 1986 and were first developed by Dr. Fyodorov. The design later inspired the current model used by Staar Surgical, (Monrovia, CA, USA), the Visian implantable collamer lens (ICL) [Figure 1] and [Figure 2]. This lens is made of a trademark material known as “collamer,” which is a copolymer of hydroxyethyl methacrylate and porcine collagen. To compare and correlate various preoperative and postoperative parameters. Fifty-nine eyes of 32 patients who underwent pIOL implantation were analyzed. The ethical standards outlined by the Medical Research Council were followed when contacting patients. A well-informed consent was obtained from the patient and relative. The Ethics committee of the hospital approved the protocol for this study. The preoperative characteristics recorded include age, preoperative refractive error, pachymetry, topography, the K-readings, white-to-white (WTW), anterior chamber depth (ACD), and specular microscopy. These parameters were used to derive a formula to predict the postoperative vault. Postoperatively, uncorrected visual acuity (UCVA), best-corrected visual acuity, specular microscopy anterior chamber angles, corneal and lens status and vaulting of the pIOL, and contrast sensitivity were recorded at 1 month. Patients were followed-up for 18 months for any complications. Based on preoperative refractive error, patients had simple myopia or compound myopic astigmatism. Preoperative corrected distant visual acuity (CDVA) and postoperative uncorrected distant visual acuity (UCDVA) was compared. Endothelial count of patients preoperatively and postoperatively was studied and compared. ACD of patients before the surgery was analyzed and compared with the gonioscopic findings postoperatively. Post operative vault was analysed and patients were grouped into 3 groups namelylow vault (<200microns), normal vault (200-800microns), and high vault (>800microns). The postoperative vault was compared with the preoperative ACD, WTW, and ICL size, and the vault was statistically correlated with these parameters. Fifty-nine eyes of 32 myopic and compound myopic astigmatism patients who underwent pIOL implantation were studied. Most common indications for undergoing pIOL implantation were either a high refractive error or an abnormal topography. Out of 59 eyes, studied 56 eyes were with compound myopic astigmatism and 3 eyes with simple myopia. Regarding the refractive correction done during surgery, the mean sphere corrected was 8.42 ± 5.52 and mean cylinder corrected was 1.5 ± 1.29. Preoperatively, the mean central corneal thickness (CCT) was 511.9 ± 42 which is in normal range of corneal thickness, though the minimal pachymetry reading was 426 μ for a patient with a refractive error of −4.5DS and −1cyl at 70°. Other than the corneal thickness, abnormal topography was also an important indication for pIOL implantation. 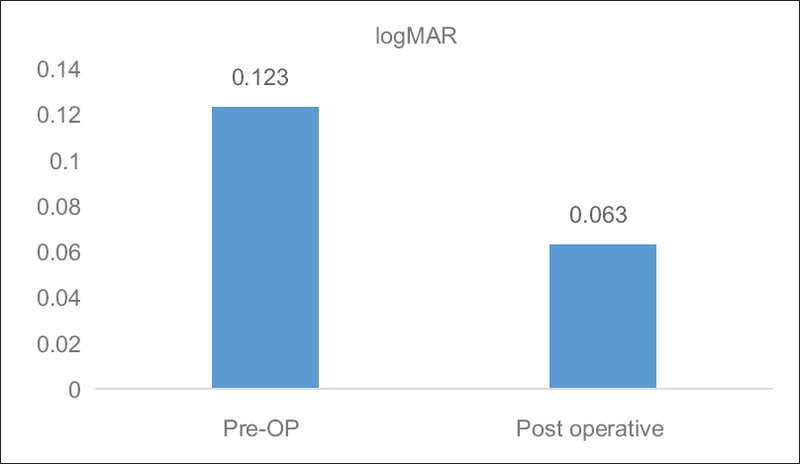 With respect to preoperative mean CDVA of 0.12+/-0.1 logMAR there was significant improvement in postoperative mean UCDVA to 0.063+/-0.11 with a statistically significant p value of 0.006 [Figure 3]. Regarding the endothelial count with a mean of 2888.8 ± 393.4 preoperatively and 2741.6 ± 332.7 postoperatively, there is statistically significant decrease in count postoperatively with a P < 0.001, although numerically, it has come down by 140 cells [Figure 4]. With respect to gonioscopy finding of pigments in angles, 24 eyes (40.68%) were with pigments postoperatively and 35 eyes (59.32%) were without pigments. Mean preoperative ACD in these patients was 3.24 ± 0.33 mm. 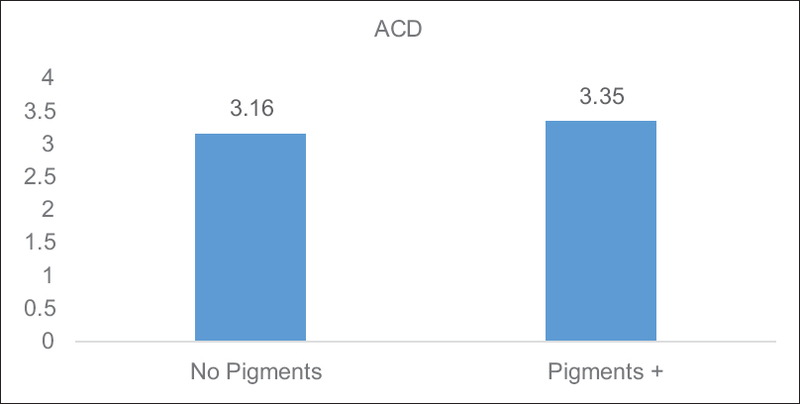 When ACD of two groups (with pigments and without pigments) was compared, there was statistically significant correlation between ACD and angle pigments. The mean ACD of group with pigments was 3.35 ± 0.37 and without pigments was 3.16 ± 0.29. The mean ACD was higher in patients with pigments [Figure 5]. The mean preoperative intraocular pressure (IOP) was 12.13 ± 2.2 mmHg and mean postoperative IOP was 13.7 ± 2.7 mmHg. Transient IOP spike was seen in two eyes of the same patient which lasted for a week which was due to steroid response. ICL vault in patients were grouped into three; <200 μ low vault, 200–800 normal vault, and >800 high vault. In this study, 84.7% of patients had normal range of vault; 8.4% had low vault and6.7% had high vault. The average postoperative pIOL vault with respect to the natural lens was 455 ± 213.2 μ. The mean ACD of patients with low vault was 3.04 ± 0.09 mm, normal vault was 3.24 ± 0.31 mm, and with high vault was 3.53 ± 0.63. Higher vaulting was seen in patients with higher ACD [Figure 6]. The mean WTW, when measured preoperatively, was 11.44 ± 0.65 mm. The mean size of ICL inserted was 12.58 mm. There is a significant change in vault with ACD, WTW, and ICL size with a weak correlation [Table 1] and [Table 2]; [Figure 7]. Postoperative vault could be predicted with the preoperative ACD, WTW, and ICL size. Postoperative vault = 155.868 (ACD) +75.33 (WTW) +110.531 (ICL size) − 2302. This formula needs to be validated with a larger sample size. Refractive surgery attempts to free a person from the use of spectacles and contact lenses. Patients with high refractive errors are not appropriate candidates for LASIK or other excimer procedures or in eyes where quick visual recovery is mandatory, an alternative treatment can be phakic IOLs, which are able to correct high levels of refractive error without ablating the cornea, or removing the natural lens. One of the key to success in refractive surgery was pIOL. To improve the accuracy of ICL, accurate preoperative measurements are fundamental. The correction of moderate to high myopia by means of pIOL implantation is effective and predictable, with a safe position of the pIOL into the anterior chamber. pIOL surgery is an efficacious technique that can provide immediate improvement in UDVA, an increase in CDVA, and preservation of accommodation. In recent years, several studies demonstrated high levels of the best corrected vision preservation and even improvement relative to preoperative values, minimal intraoperative and postoperative complications, early and stable improvement in vision and high degree of predictability by myopic ICL and toric ICL. We found in our sample of eyes that the pIOL provided an efficient, predictable, and safe correction of the spherocylindrical error, with a great percentage of eyes gaining lines of visual acuity. The mean preoperative CDVA in our study was 0.1 ± 0.1 logMAR and postoperative UCDVA was 0.6 ± 0.1. There was significant improvement in postoperative UDVA compared to preoperative CDVA with gain of lines. In 12% of eyes, we also saw that the postoperative UCVA was two lines lesser than the preoperative CDVA, and this was due to minimal residual refractive error. Igarashi studied 46 eyes of 33 patients undergoing ICL implantation and 47 eyes of 29 patients undergoing wavefront-guided (WFG) LASIK for the correction of high myopia and found that ocular coma-like aberrations, spherical-like aberrations, and total higher-order aberrations after ICL implantation were significantly less than those after WFG-LASIK. In our study, we did not have a comparison with LASIK patients, but contrast sensitivity was analyzed and the mean contrast sensitivity was 1.73 with Pelli–Robson contrast sensitivity chart. The distance between the posterior ICL surface and the anterior crystalline lens pole is termed the ICL vault, which is crucial regarding the incidence of anterior subcapsular cataract formation. With respect to cataract development, Gonvers and associates suggested that a central vault of more than 0.09 mm seems to protect the crystalline lens from cataract formation. The ideal postoperative vault must create a space over the entire anterior crystalline lens surface, with 1.00–1.50 CCT, on slit-lamp examination. While poor vault (<250 μm) increases risk of cataract development, excessive vault (>750 μm) may result in pupillary block angle-closure glaucoma. Kojima et al. studied 36 eyes which underwent ICL implantation and found that mean vault at 1-year postoperative was 0.53 ± 0.25 mm. The percentages of eyes in the low-, moderate-, and high-vault groups were 13.9%, 72.2%, and 13.9%, respectively. A significant decrease in the vault was noted up to 1 month, after which the value stabilized (P < 0.0001). High vault showed a gradual decrease up to 3 months (P < 0.0001), after which the value stabilized. 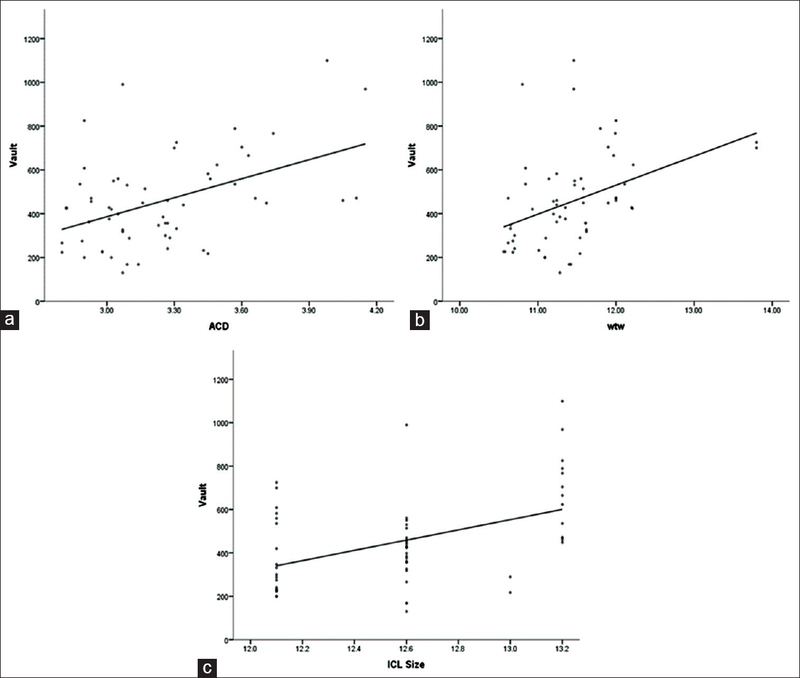 A statistically significant correlation was present between the change noted for vault values during the 1-year follow-up period, and those measured for the initial vault on postoperative day 1 (P < 0.0001, r2 = 0.6393). In our study, 84.7% of patients had normal range of vault; 8.4% had low vault and 6.7% had high vault. The average postoperative pIOL vault was 455 ± 213.2 μ. We did the measurement by ASOCT atone month follow up visit. At this time, the study patient with lowest vault was 130 μ. According to Takashi Kojima study, chance of decrease in the vault is less in lesser vault patients, although we did not have measurements of long-term follow-up vault. In this study, we analyzed the preoperative ACD of all patients and compared it with the vaulting. We found that the mean ACD of patients with low vault was 3.04 ± 0.09 mm, normal vault was 3.24 ± 0.31 mm, and with high vault was 3.53 ± 0.63. Higher vaulting was seen in patients with higher ACD. The higher vault is related to higher ACD and that with low vault with low ACD. 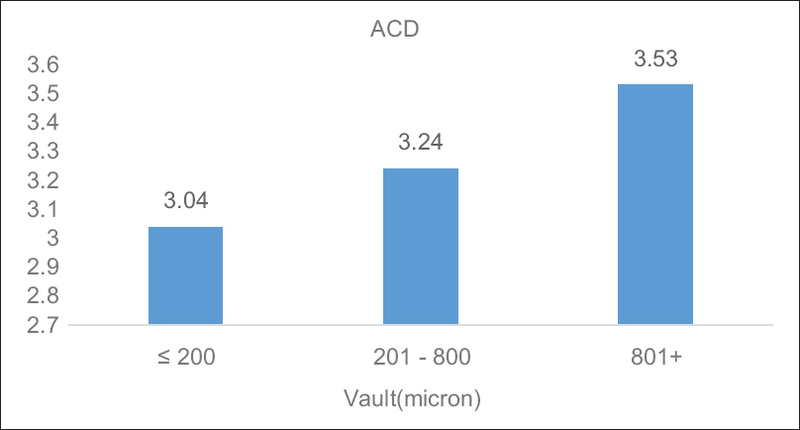 We found out that there is correlation of vault with ACD, WTW, and ICL size. There are no studies done on these parameters as such, but we analyzed these and came to the fact that there is significant change in vault with an increase in ACD, WTW, and ICL size. We also derived a regression formula using our data to predict postoperative vault with preoperative parameters. The validation of this formula would require another large cohort of patients. Fujisawa et al. report that inserting an implantable collamer pIOL alters the dynamics of the aqueous humor and results in IOP elevation. In our study, the mean IOP was 13.74 ± 2.8 mmHg postoperatively after 1 month. Even though the mean was in normal range, we had two patients with IOP of 20 and 24 mmHg. In our study, we analyzed the postoperative gonioscopy findings and compared it with the ACD. There was statistically significant correlation between ACD and angle pigments. The mean ACD of group with pigments was 3.35 ± 0.37 and without pigments was 3.16 ± 0.29. The mean ACD was higher in patients with pigments. There were no studies done on the relationship between these parameters. Sanders studied 526 eyes, which were followed for an average of 4.7 years to evaluate the incidence of asymptomatic and clinically significant anterior subcapsular opacities and found that approximately 6%–7% of eyes develop anterior subcapsular opacities at 7+ years following ICL implantation, but only 1%–2% progress to clinically significant cataract during the study period. In our study, we did not find any lens opacities, but our follow-up period was so small to document on complications. Comprehensive preoperative evaluation and long-term postoperative follow-up examinations are needed to monitor and prevent serious complications and to establish long-term safety. Future research should be directed at studying of the long-term efficacy and complications of pIOL. Limitation of the study include detailed subgroup analysis could not be done and long-term complications such as glaucoma and cataract need long-time follow-up. Posterior chamber pIOLs are a safe and predictable means of providing good vision, especially in high myopes with borderline corneae. 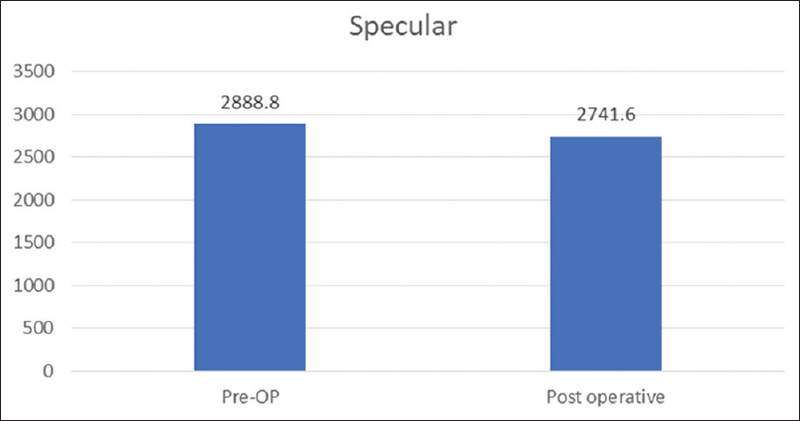 Most of the patients in our study showed significant improvement in vision with most of them gaining more lines than preoperative CDVA after pIOL implantation. In our study, there was a significant relationship between the vault of ICL and the ACD measured preoperatively. In our study, none of them had complications as such. In conclusion, as the follow-up in our study was relatively short, we cannot be certain of the long-term safety of this procedure. We have demonstrated excellent predictability, efficacy, and good visual results. Accurate preoperative sizing of the lens is a key to optimum results. Chen LJ, Chang YJ, Kuo JC, Rajagopal R, Azar DT. Metaanalysis of cataract development after phakic intraocular lens surgery. J Cataract Refract Surg 2008;34:1181-200. Praeger DL, Momose A, Muroff LL. Thirty-six month follow-up of a contemporary phakic intraocular lens for the surgical correction of myopia. Ann Ophthalmol 1991;23:6-10. Huang D, Schallhorn SC, Sugar A, Farjo AA, Majmudar PA, Trattler WB, et al. Phakic intraocular lens implantation for the correction of myopia: A report by the American Academy of Ophthalmology. Ophthalmology 2009;116:2244-58. Hersh PS, Fry K, Blaker JW. Spherical aberration after laser in situ keratomileusis and photorefractive keratectomy. Clinical results and theoretical models of etiology. J Cataract Refract Surg 2003;29:2096-104. Yoon G, Macrae S, Williams DR, Cox IG. Causes of spherical aberration induced by laser refractive surgery. J Cataract Refract Surg 2005;31:127-35. Zaldivar R, Davidorf JM, Oscherow S. Posterior chamber phakic intraocular lens for myopia of -8 to -19 diopters. J Refract Surg 1998;14:294-305. Hashemian S, Bigzadeh F, Foroutan A, Tajoddini S, Ghaempanah MJ, Jafari ME, et al. ICL and toric ICL for high myopia with and without astigmatism. Iran J Ophthalmol 2013;25:8-18. Chang DH, Davis EA. Phakic intraocular lenses. Curr Opin Ophthalmol 2006;17:99-104. Güell JL, Morral M, Kook D, Kohnen T. Phakic intraocular lenses part 1: Historical overview, current models, selection criteria, and surgical techniques. J Cataract Refract Surg 2010;36:1976-93. Güell JL, Morral M, Gris O, Gaytan J, Sisquella M, Manero F. Five-year follow-up of 399 phakic artisan-verisyse implantation for myopia, hyperopia, and/or astigmatism. Ophthalmology 2008;115:1002-12. Velarde JI, Anton PG, de ValentinGamazo L. Intraocular lens implantation and laser in situ keratomileusis (bioptics) to correct high myopia and hyperopia with astigmatism. J Refract Surg 2001;17:S234-7. Pérez-Cambrodí RJ, Piñero DP, Blanes-Mompó FJ, BlascoTF, Cerviño A. Preliminary in vivo positional analysis of a posterior chamber phakic intraocular lens by optical coherence tomography and its correlation with clinical outcomes. J Optom 2012;5:121-30. Sanders DR, Vukich JA, Doney K, Gaston M. Implantable Contact Lens in Treatment of Myopia Study Group. U.S. Food and drug administration clinical trial of the implantable contact lens for moderate to high myopia. Ophthalmology 2003;110:255-66. Igarashi A, Kamiya K, Shimizu K, Komatsu M. Visual performance after implantable collamer lens implantation and wavefront-guided laser in situ keratomileusis for high myopia. Am J Ophthalmol 2009;148:164-700. 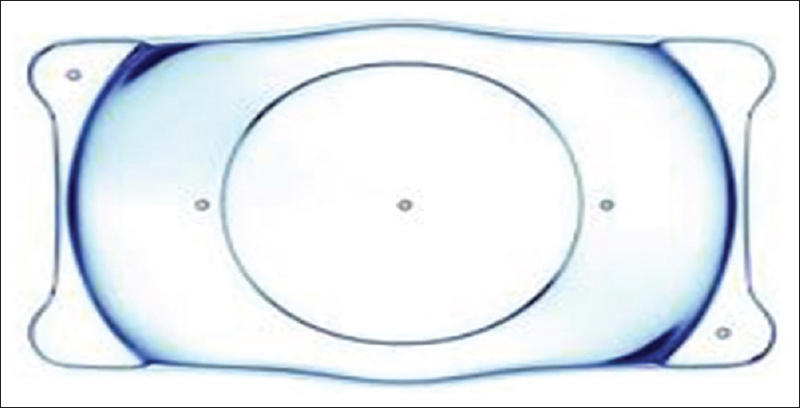 Gonvers M, Bornet C, Othenin-Girard P. Implantable contact lens for moderate to high myopia: Relationship of vaulting to cataract formation. J Cataract Refract Surg 2003;29:918-24. Kojima T, Maeda M, Yoshida Y, Ito M, Nakamura T, Hara S, et al. Posterior chamber phakic implantable collamer lens: Changes in vault during 1 year. J Refract Surg 2010;26:327-32. Fujisawa K, Shimizu K, Uga S, Suzuki M, Nagano K, Murakami Y, et al. Changes in the crystalline lens resulting from insertion of a phakic IOL (ICL) into the porcine eye. Graefes Arch ClinExp Ophthalmol 2007;245:114-22. Sanders DR. Anterior subcapsular opacities and cataracts 5 years after surgery in the visian implantable collamer lens FDA trial. J Refract Surg 2008;24:566-70.